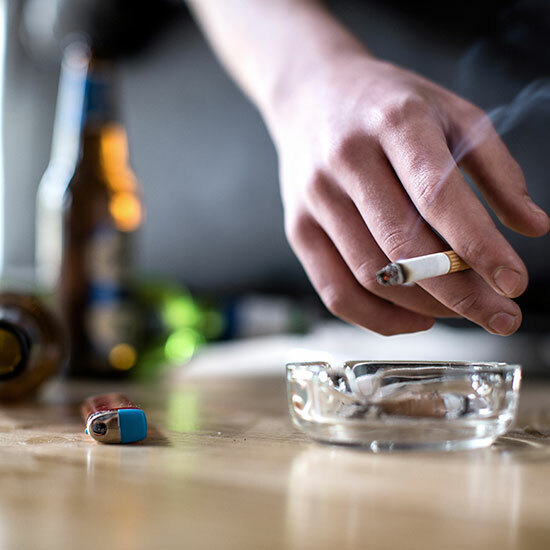 British families are spending less money on cigarettes and alcohol, according to new data from the U.K.’s Office for National Statistics (ONS). The average weekly household spending on tobacco fell by £0.30 ($0.37) to £3.60 ($4.47) in 2015/16, compared with £3.90 in 2014/15 ($4.85). ONS says this likely has to do with an overall decline in the number of smokers in the U.K.
Interestingly, tobacco spending is extremely varied across households in the U.K.: the average amount of money spent on cigarettes each week in England was £2.90 ($3.60), while it’s £3.00 ($3.73) in Wales, £4.90 ($6.09) in Scotland, and £6.60 ($8.20) in Northern Ireland. The latter is shy of the average $10.56 New Yorkers spent in 2015, according to the CDC. The average weekly spending on alcoholic drinks in 2015/16 was £7.80 ($9.69), with wine in particular making up 42% of all money spent on alcoholic drinks consumed in the home. The majority of alcoholic drink sub-categories had the same or decreased spending between 2014/15 and 2015/16, ONS reports. This is the first time the total average weekly spending on alcohol, tobacco, and narcotics has fallen below £12.00 ($14.91) in the U.K., equaling 2% of total household spending. Contrastingly, at the start of the millennium, families were typically spending nearly £20 ($24.85) a week on similar items. That said, ONS found that more Brits were spending money on eating out in restaurants and staying in hotels.